This interview took place on: July 18, 2017. 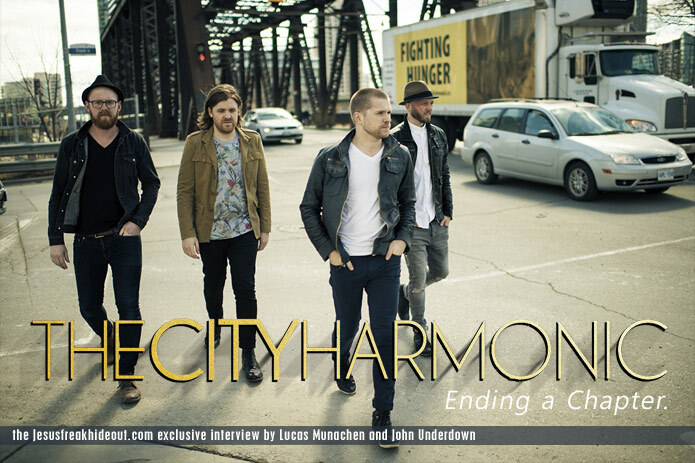 Click here for The City Harmonic's Artist Profile page. Lucas Munachen: You guys have been a band for eight years now and have made some fantastic music together, so what sparked the decision to end this chapter of your lives? Elias Dummer: A few things - but mostly, the desire to be closer to our families and our home churches and home communities, and a belief that God was calling us to end this here and now. I heard someone say, "It's always better to close the book than have someone else close it for you," and I think that captures the heart of what's here. We did a whole bunch of intentional things together, and managed to keep our relationships strong through that. That's hard to do, and I'm proud that it worked out as well as it has for us. John Underdown: How do you stay honest in worship--both in leading and writing--without dumbing it down? Elias: I'm not sure you ever need to "dumb it down" per se, but translate. I think we should be tirelessly careful not to confuse flowery or technical theological language with understanding. I think it was Einstein who said, "If you can't explain it simply, you don't understand it well enough." I think when it comes to writing songs or leading, this rings true. Are you saying something you believe and that rings true for you? Or, just something that sounds "Christian?" I think it's pretty darned important to know the difference. John: I listen to your songs and get a sense of theological depth. How important was theology to your music? Elias: Hugely. Both the pursuit of God and an understanding of our theology, traditions, and roots across various denominations - but also the focus on seeing the common ground and translating it for others. John: Why did you pick the songs that you did for the Benediction setlist? Elias: We set out to make a live worship album - to really capture the spirit of how we imagined our songs to be - and for the most part, that's how we chose these songs. Some of them are unavoidable and we loved including those, but some were just songs we knew we'd sing at our churches (or have, in most cases), and wanted to bring that to the forefront for this final project. Lucas: Throughout the songs on Benediction, I see this theme of God's work in our lives and our response, either by being a beacon of light for the lost or by praising in our darkest times. Was this theme deliberate or was it something that appeared naturally? Elias: Well, it's deliberate, but because it's something we've lived through. I think of so much of our lives in terms of the worship of Christ--not just our singing--and with Eric's cancer a few years ago, and the way that shaped us, I think that theme is something we've really had to wrestle with through different things. Lucas: "Honestly" is one of my favorite songs on the new record. Can you tell us about the inspiration behind it? Elias: Yeah! It's a song inspired, in part, by Psalm 51. People are usually familiar with a chunk of it… "create in me a clean heart," and so on. But there's this section where the writer starts to unpack what that means. He says: "A broken and contrite heart, O God, you will not despise." There's this sense that returning to God means recognizing our need, not just our want or wish, for Jesus. One way or another, recognizing our brokenness is at the heart of Christian living. This song is our way of turning that into a prayer, of asking God to bring us to that place (even though it's hard), if it means following him more closely and living a life that is thriving in Kingdom terms. John: What was it like when the concert was over? How did you feel about it? Elias: It was incredibly bittersweet. We had this amazing moment where Eric ran back on stage and sang the encore with us, and everybody was there, all at once. It was also just beautiful to be there with so many friends and family, and folks who have supported us through the years. Lucas: During the past few years of being a band, what were some of the most important lessons God taught you during this time? Elias: That no one of us has it all figured out - that somebody else's mistake might be better than my idea, and that God doesn't want us to be lonely hero-cowboys in ministry, but to work as part of the wider family and Body of Christ. Lucas: Having eight years of experience as worship artists, what is the one piece of advice you would give other bands who are starting out in the ministry? Elias: Stay rooted in your community. This is an incredible adventure, but it can't replace the power of having a community of faith that knows you without needing you to produce something - that stress also hurts the art, I think. I do a few different things, and it's because I started to see a few years ago that I was writing and leading with less courage and effectiveness when I was solely dependent on one source of income. I think I was just afraid in a lot of ways. So find a way to make it so you can follow Christ with courage, and lead the same way. John: Just for fun, would you rather be a cowboy or an astronaut? Elias: Well, now that I said what I did a moment ago, I guess I have to say an astronaut. Actually, either way - totally an astronaut. John: What's next for you after The City Harmonic? Elias: I've been involved with planting a church just outside Nashville the last year and a half, which has been incredible. So training worship leaders there and leading, of course. So, before long I'll be working on new music of my own, and I know Aaron will too. So on top of church, and music and writing, I've owned a marketing agency for almost 10 years, so it's been fun to be doing all kinds of creative things and helping people translate what they do in a way that energizes others. All of it excites me, and I love the mix of things I'm doing at the moment. Thanks for asking! 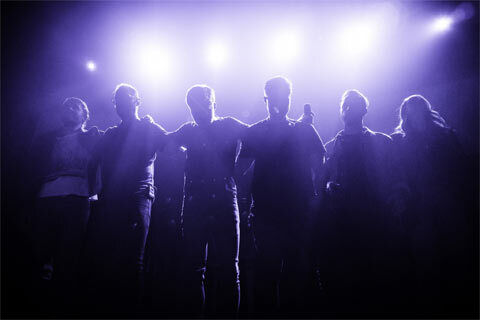 The City Harmonic's latest album, Benediction (Live) is available now wherever music is sold!